Summary: "Marianne Daventry will do anything to escape the boredom of Bath and the amorous attentions of an unwanted suitor. So when an invitation arrives from her twin sister, Cecily, to join her at a sprawling country estate, she jumps at the chance. Thinking she'll be able to relax and enjoy her beloved English countryside while her sister snags the handsome heir of Edenbrooke, Marianne finds that even the best laid plans can go awry. From a terrifying run-in with a highwayman to a seemingly harmless flirtation, Marianne finds herself embroiled in an unexpected adventure filled with enough romance and intrigue to keep her mind racing. Will Marianne be able to rein in her traitorous heart, or will a mysterious stranger sweep her off her feet? Fate had something other than a relaxing summer in mind when it sent Marianne to Edenbrooke." Review: Do yourself a favor: Find a hammock, grab a smoothie, and read this book. You will have one of the most delightful and charming afternoons of your life. 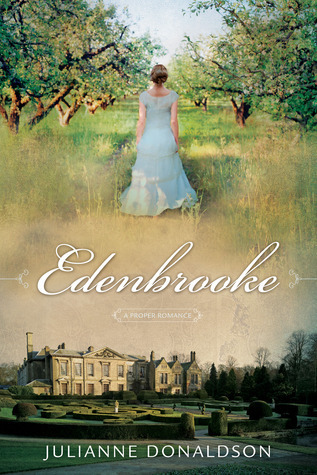 Edenbrooke's cover claims it to be "a proper romance." That pretty much sums it up. This book is wholeheartedly and unabashedly a love story. Marianne is a heroine with gumption, Philip is a hero with principles, and together they have some wonderfully witty dialogue and fabulously swoonish dance scenes. The rest of the cast was delightful as well. I particularly loved Caroline's kindness and elegance. Mr. and Mrs. Clumpett provided some wonderful comedic relief. And Marianne's grandmother bore a striking resemblance to Downton Abbey's Lady Violet Crawley, which is about the highest compliment that could ever be paid to anyone. I was a little bothered by the back of the book. There are three quotes under the title "Praise for Edenbrooke" given by the wives of New York Times bestselling authors. Not the bestselling authors themselves, mind you, but their wives. I understand that this book is marketed primarily to women, but if they wanted quotes from women on the back to help market the book, there are plenty of female bestselling authors out there to choose from. Those women may be married to talented writers, but they themselves don't hold credentials that should sway a reader. I do not mean to offend those women, they are certainly entitled to their opinions. The way it was presented just seems manipulative to me. It feels a little bit like a trick, just so that they could use the words "New York Times bestselling author" on the back of the book without actually having praise from any single person who actually holds that title. It's as if someone asked me to provide criticism on the evolution of the common-law doctrine of promissory estoppel, simply because I'm married to a lawyer. Sure, I could do some research and come up with something, but Law is not my area of expertise and my opinion on the subject doesn't belong in court. ANYWAY, that bit of annoyance is targeted more at the marketers of this book, not at the book itself. Back to the book. This story is lovely and charming and will leave a smile on your face for days afterwards. It was definitely worth the read. I'd recommend it to fans of Jane Austen and/or fans of the Regency era who enjoy a good romance and prefer their books to be clean, or who are just looking for something to brighten their day. Yay! Thanks for the recommendation, just requested it from the library. Ooh Janelle this one is right up your alley. I predict that you'll love it. Enjoy! Oh Thur, I think you'll like this one a lot! It's just so fun. Enjoy!